The objective of this paper is to reflect on our experience in a serious game research project, named SimParc, about multi-agent support for participatory management of protected areas for biodiversity conservation and social inclusion. Our project has a clear filiation with the MAS-RPG methodology developed by the ComMod action-research community, where multi-agent simulation (MAS) computes the dynamics of the resources and role-playing game (RPG) represents the actions and dialogue between stakeholders about the resources. We have explored some specific directions, such as: dialogue support for negotiation; argumentation-based decision making and its explanation; technical assistance to the players based on viability modeling. In our project, multi-agent based simulation focuses on the negotiation process itself, performed by human players and some artificial participants/agents, rather than on the simulation of the resources dynamics. Meanwhile, we have also reintroduced the modeling of the socioecosystem dynamics, but as a local technical assistance/analysis tool for the players. A significant challenge involved in biodiversity conservation is the management of protected areas (ex: national parks, marine reserves, biosphere reserves… – the main focus of this work being national parks), which usually undergo various pressures on resources use and access, resulting in many conflicts. Methodologies intending to facilitate participatory management and conflict resolution are being addressed via bottom-up approaches that emphasize the role of social actors (stakeholders) involved in these conflicts. Examples of social actors are: park managers, representatives of local communities at the border area, tourism operators, public agencies and nongovernmental organizations (NGOs). Examples of inherent conflicts connected with biodiversity protection are: irregular occupation, inadequate tourism exploration, water pollution, environmental degradation and illegal use of natural resources. In Latin America, the process of management of protected areas for biodiversity conservation usually takes place through the mediation of institutional arenas of dialogue and conflicts, implemented though a management council (Irving 2006). This council, of a participatory nature, includes representatives of various social actors/stakeholders. They represent and express various perspectives and participate in dialogue, negotiations and decisions about protected areas management. We are conducting a research project to explore how advanced computer support (distributed role-playing game, simulation, artificial agents, negotiation support, decision support…) can help participatory management of protected areas. The project is named SimParc (which stands in French for “Simulation de gestion participative de parcs”) and is based on a serious game. Serious games and role-playing games have indeed received increased attention (Crookall, 2010) as effective approaches for exploration and training, in context but without high costs or risks (Michael, 2006). They are considered as promising pedagogical tools for complex collective decision making processes. 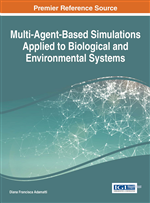 Note that, although our project has a very clear filiation with the well known MAS-RPG (Multi-Agent-Simulation – Role-Playing Games) methodology (Barreteau, 2003), developed by the companion modeling (ComMod, by Barreteau et al. (2003)) action-research community about participatory management of renewable resources, we have explored some specific directions, such as: dialogue support for negotiation; argumentation-based decision making and its explanation; technical assistance to the players based on viability modeling. The objective of this chapter is therefore to discuss the rationales behind the specificities of our project and detail our design, results as well as prospects for future works.